With about 20.000 Castles in Germany (yes, 20.000), it’s not easy to choose the most beautiful ones and list them up. 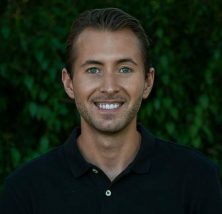 I’ve recently been on a big road trip through the country, and here is a list of German Castles that are personal favorites! They are not ranked in any particular order, and they are all amazing castles that are worth a visit! 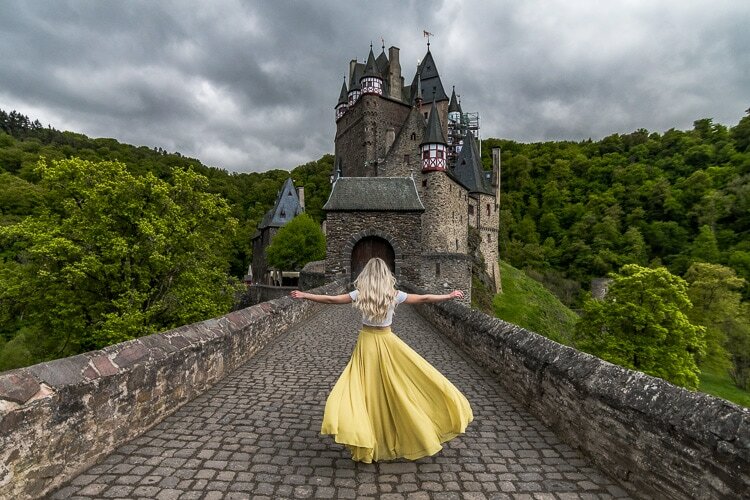 Let’s start with one of the fairytale castles in Germany – The Eltz Castle, which is quite unique. It has never been destroyed and has remained within the same family for 33 generations. Going here early in the morning when there are no other tourists around will certainly make you feel like you’re in a German saga. Lichtenstein is one of the most beautiful castles in Germany which for some reason remains relatively unknown among international tourists. 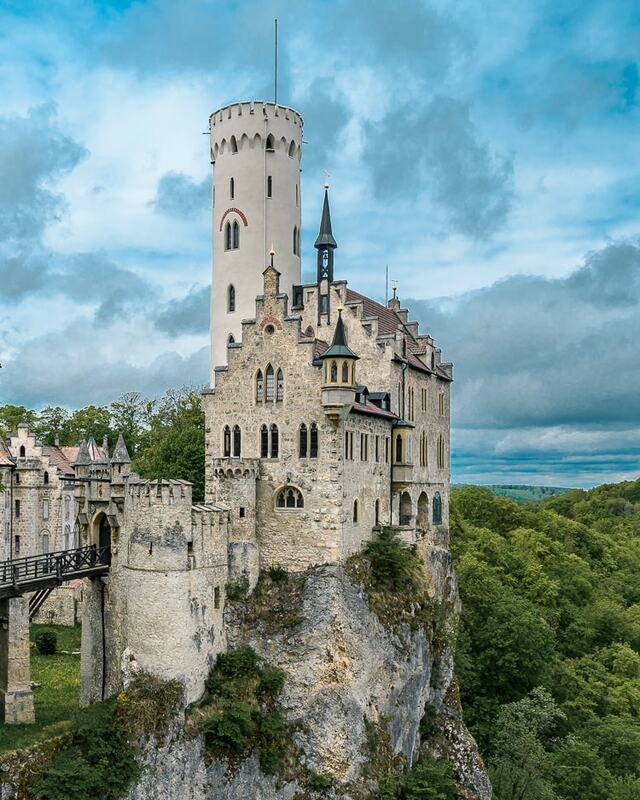 The name Lichtenstein would translate into “shining stone” and this 1800’s castle is built in the gothic revival style. It is located about 1 hour south of Stuttgart. Entrance fee: 2 Euro for the garden or 8 Euro for a guided tour inside. A late medieval/early renaissance castle that lies between Würzburg and Frankfurt. It has quite a peculiar look and it was actually a simple house from the beginning, owned by Hamman Echter. Only the round tower stands from the 1400s after Schloss Mespelbrunn was rebuilt in the middle of the 1500s. 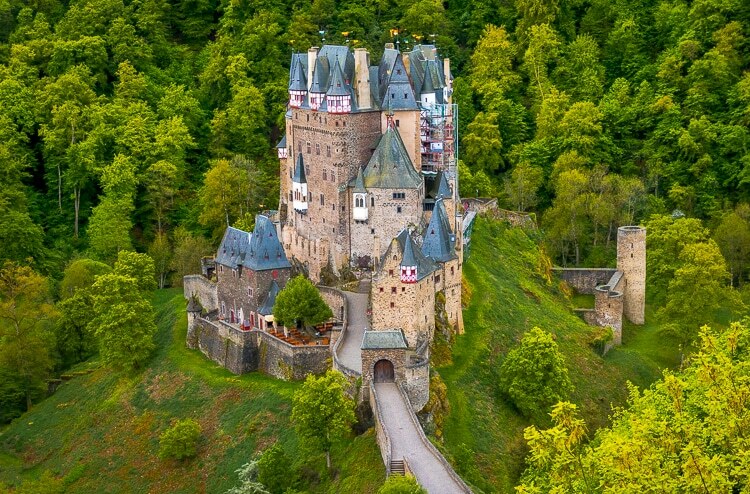 One of the fairytale castles in Germany besides Burg Eltz and Neuschwanstein. 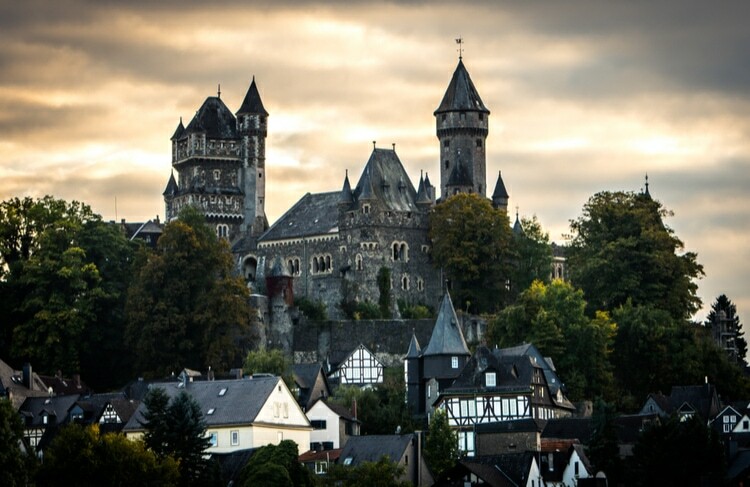 Drachenburg is located close to the city of Bonn and lies beautifully on top of a hill. 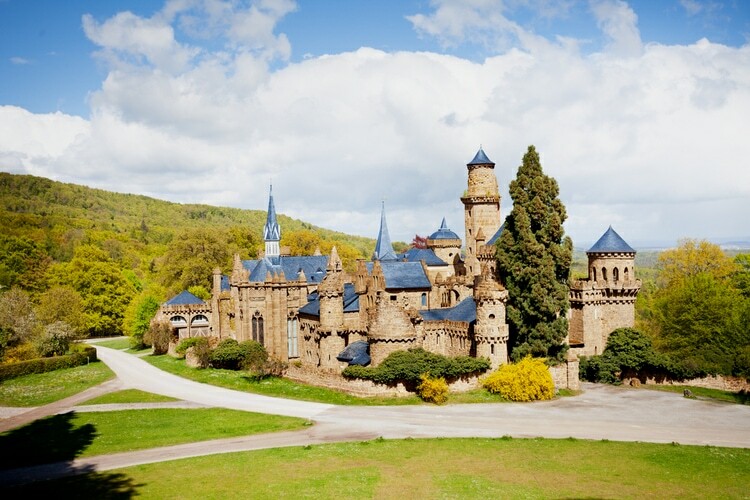 Drachenburg was built in the late 1800s and has a grand architecture in a Neogothic style worthy of a king! However, no king has ever lived here. Instead, it was built by Baron Stephan von Sarter. Neuschwanstein isn’t the oldest castle in Germany, but it sure is the most famous German castle. It was built by the “Mad King” King Ludwig II of Bavaria in the 1860s. It is said to have inspired Walt Disney himself when creating the Cinderella castle. If you only have time to visit one German castle, then Neuschwanstein should be it. The inside is just as royal as you would imagine from the real-life Disney castle in Germany. You can certainly tell that King Ludwig II had an extravagant and grand taste, to say the least when decorating his new home. This is the childhood home of King Ludwig II of Bavaria. Hohenschwangau is located below Neuschwanstein, and when you’re walking up to the Neuschwanstein viewpoint, you’ll get a spectacular view of Hohenschwangau. 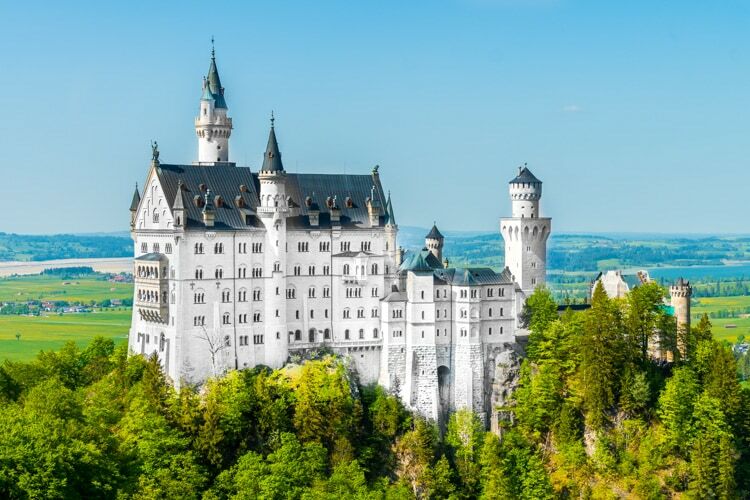 It is beautifully perched on top of the hill, and if you want to visit both Neuschwanstein and Hohenschwangau, you can get a combination ticket for 25 Euro. Entrance fee: 13 Euro for adults and free for children up to 18. A guided tour is included. It is located in Glücksburg, which is very near the Danish border in North Germany. Entrance fee: 8 Euro for adults. Another spectacular castle in German that sits atop a hill. The way up to Hohenzollern features a quite steep pathway that takes 30 minutes to finish. Luckily, if you’re not up to walking, there’s a shuttle bus that goes from the parking lot. 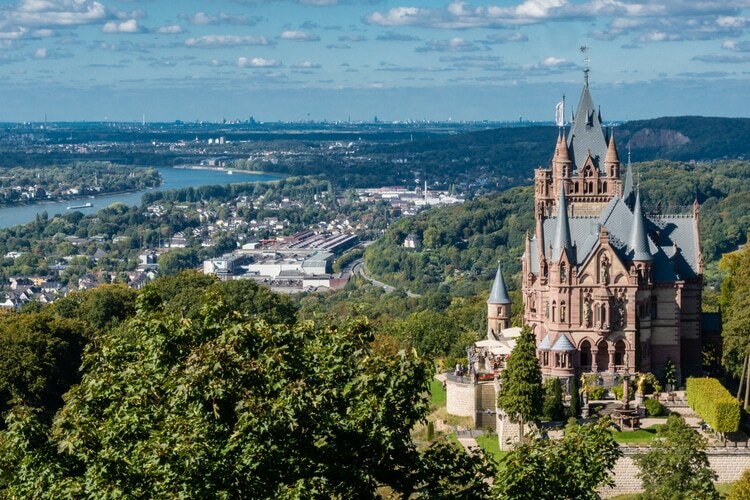 There have been 3 castles built on the top of Mount Hohenzollern since the early 11th century. The first one got completely destroyed in 1423 after a long siege, and the second version was rebuilt from 1454 to 1461. It remained intact a few hundred years, but gradually lost its importance. 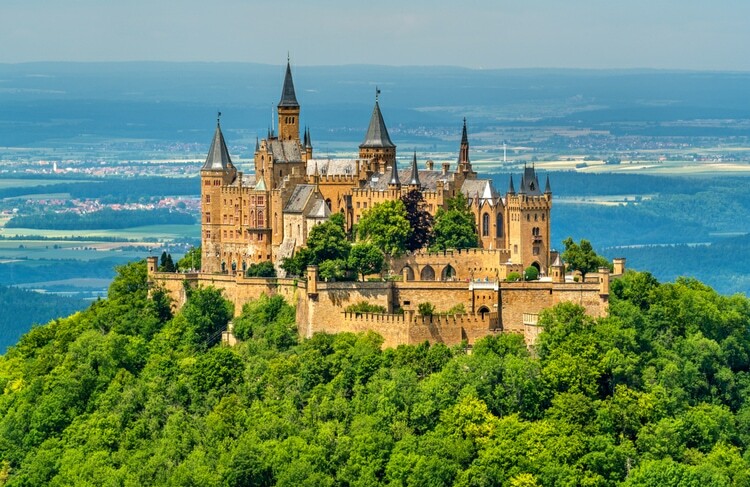 At the end of the 1700s, they demolished buildings that were damaged, and finally, the third and still standing Hohenzollern castle was built from 1846 to 1867. Entrance fee: 7 Euro without visiting interior rooms and 12 Euro for a full ticket. A former medieval fortress that was turned into a beautiful palace. 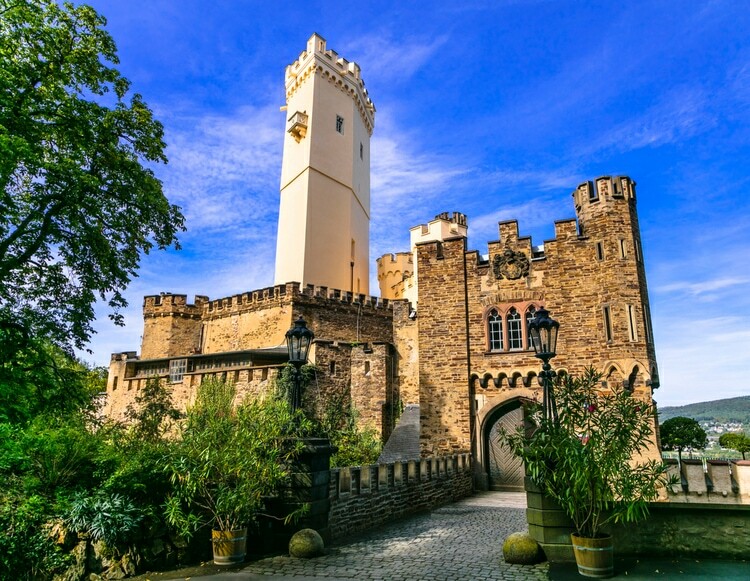 Schloss Stolzenfels is located near Koblenz and is part of World Heritage Sites in Upper Middle Rhine Valley. It was first built in the 13th century, but got completely ruined before the Prussian Crownprince (Frederick William) rebuilt it into a palace with a Gothic Revival architecture. This is one of the best castle hotels in Germany, yes you read that right. It’s possible to rent a room and stay in Burg Satzvey! Entrance fee: Free to enter Castle grounds. 5 Euro for a guided tour of the castle. 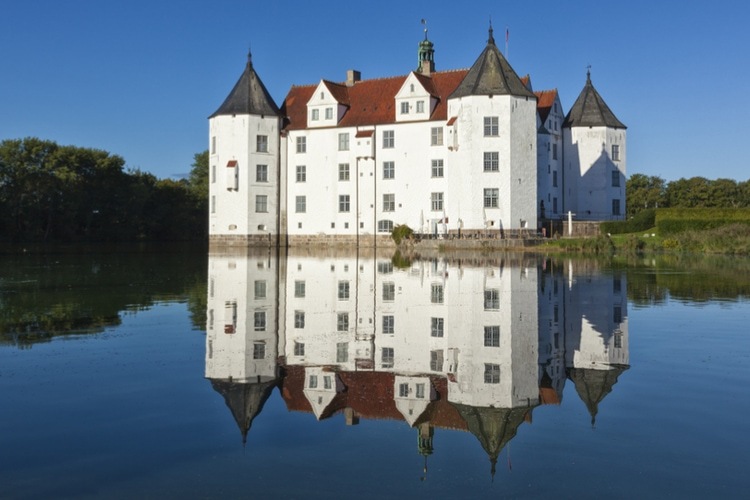 The first Schloss Braunfels was built already in the 13th century by the Counts of Nassau. It was destroyed at two times, first in 1384, and later again in a big fire in 1679. Much of the castle was burnt down, and it got rebuilt into a Baroque residence. A palatial Schloss that used to be home to the Grand dukes of Mecklenburg. 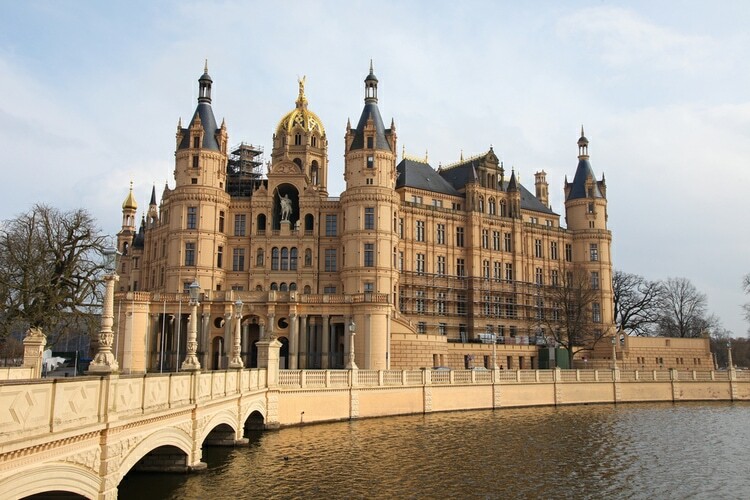 It is situated by the water in Schwerin, which is the capital of Mecklenburg-Vorpommern state. It is often nicknamed the “Neuschwanstein of the North”. If you want to see ghosts, the Schweriner Schloss is said to be frequently visited by the Ghost of Petermännchen. Entrance fee: 8,5 Euro for adults. 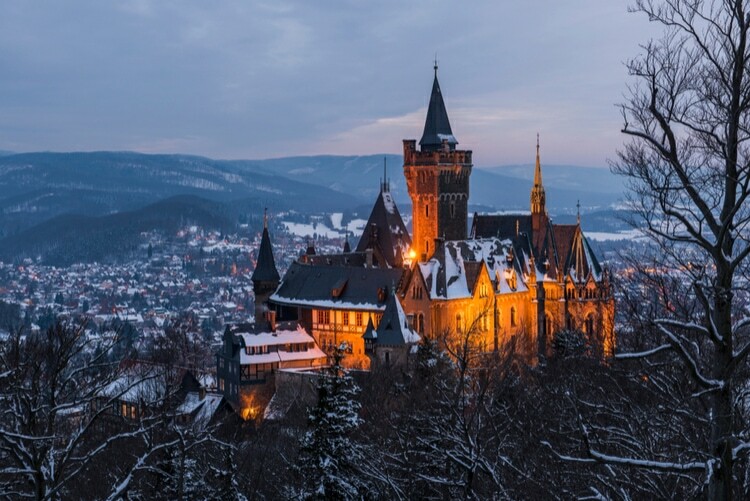 Atop a hill in the Harz mountains lies the beautiful Wernigerode Castle which was first mentioned in 1213. It has been rebuilt many times since then. In the early 18th century it was rebuilt into a Baroque style, and about 150 years later, Count Otto rebuilt it extensively into a Neo-Romantic castle. Entrance fee: 7 Euro for adults. I found this castle when we were exploring the Moselle region, and it sits majestically on top of a 100-meter high hill. The Mosel valley is famous for its wine, and below the castle are many vineyards. 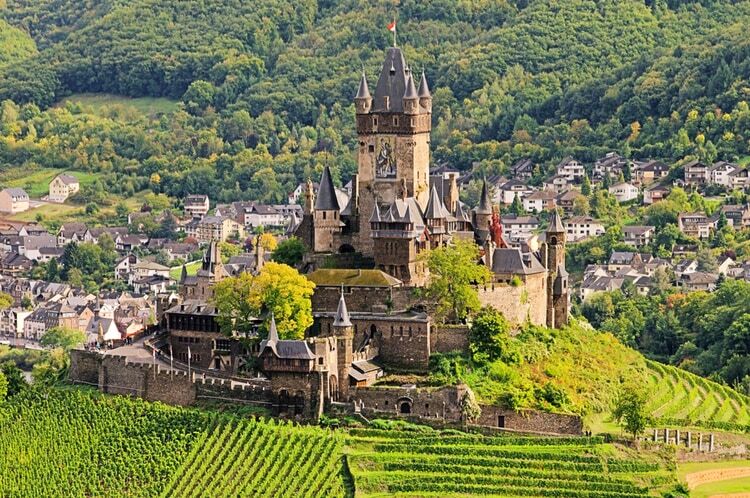 The Cochem Castle or Reichburg Cochem as it’s known in German is more than 1000 years old! Visitors are only allowed to enter by joining one of the guided tours, which is included in the price. Entrance fee: 6 Euro for adults. A moated castle in North-Rhine Westphalia, known in German as Museum Wasserburg Anholt. It is one of the few privately owned castles in Germany, and it was first mentioned in the 12th century. it’s also one of the castle hotels in Germany where regular people can book a room and stay overnight. Entrance fee: 12-15 Euro for adults. One of several moated castles in Germany. It was first built in the early 1300s but was later reconstructed into a neo-gothic structure. 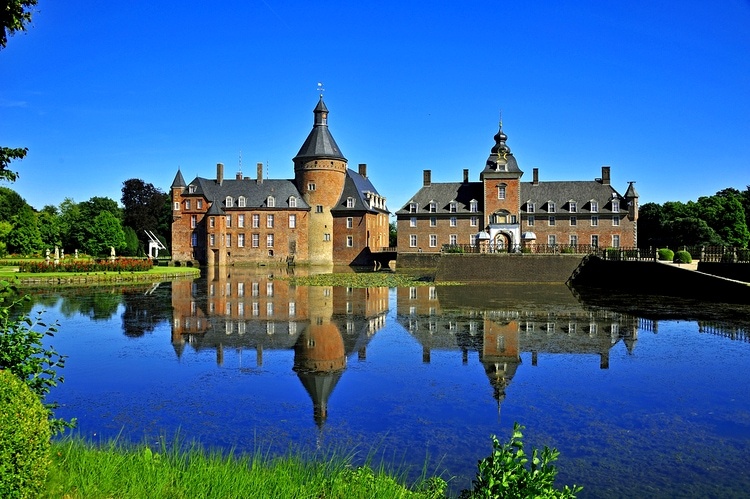 Compared to other German castles on the list, Moyland is quite small but very charming. 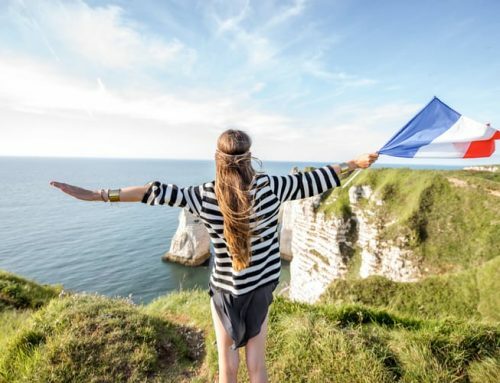 It’s located close to the Dutch border in North-West Germany, in the district of Kieve. Entrance fee: 7 euro (adults). A medieval castle that was added to the World Heritage List by UNESCO in 1999. This is the place where Martin Luther translated the New Testament of the Bible into German, and it is also the former home of Hungarian queen Elisabeth. Much of the exterior of the castle is still the same original structures that were built from the 12th century and onwards. 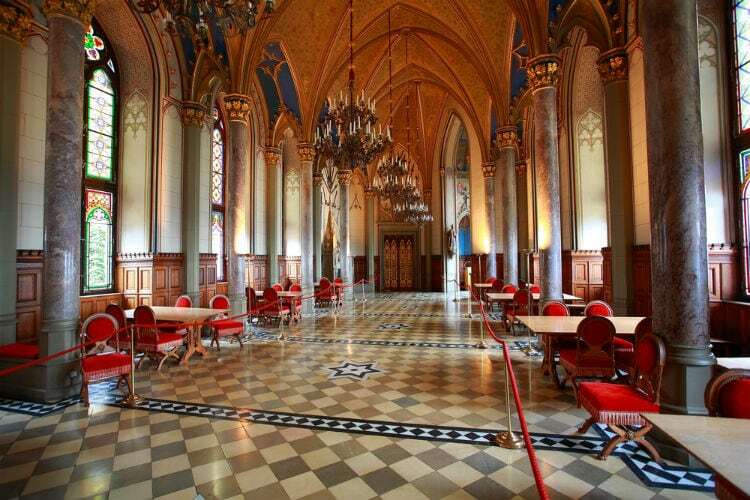 However, inside most of the interior only dates back to the 19th century. 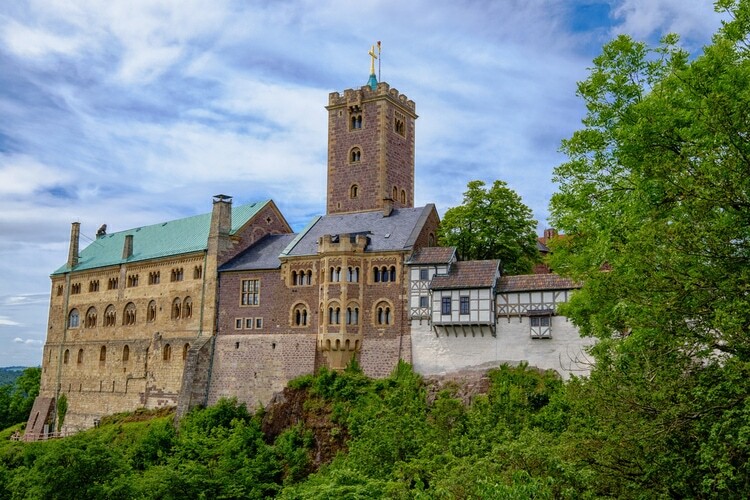 Nonetheless, Wartburg is a fantastic castle located in Central Germany, about 2,5 hours northeast of Frankfurt. This German castle holds a Guinness World Record for being the longest castle complex in the world at 1051 meter. 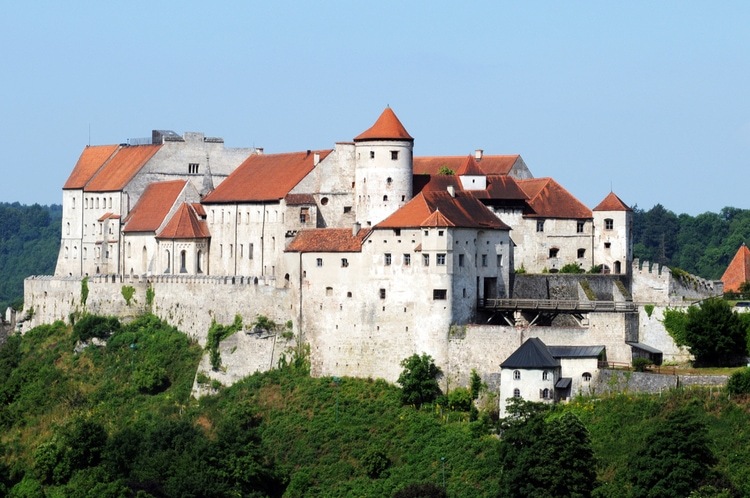 It has a gothic architecture and lies in Burghausen in Upper Bavaria. Entrance fee: 4,50 Euro for adults. Heidelberger Schloss is more of a complex that functioned as a city rather than one structure, and its castle grounds is huge although much of it is in ruins nowadays. It began construction already in the early 13th century and was later expanded by the end of the same century. Heidelberg is one of the most famous castles in Germany. Entrance fee: 8 Euro + 4 Euro if you want a guided tour. 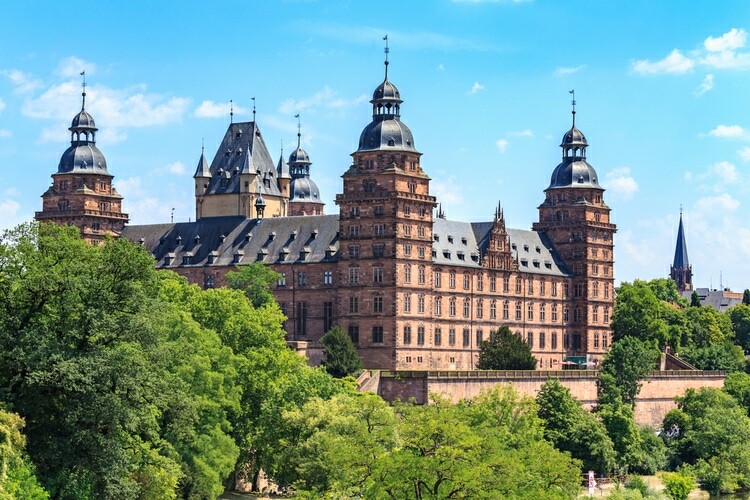 This majestic castle is constructed of red sandstone and was completed in 1614 for Johann Schweikhard von Kronberg, who was the Prince Bishop of Mainz. 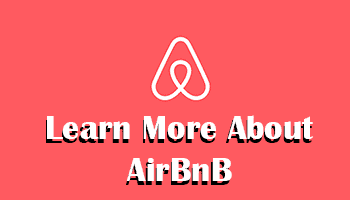 It’s located in the Bavarian state in the town of Aschaffenburg. Last but not least, another beautiful fairytale castle in Germany! Löwenburg with its blue towers and unique architecture easily makes you feel that you’re walking into a Disney movie. Entrance fee: 2 Euro, which include a guided tour. There are more than 20,000 castles in Germany, including ruins. They are scattered all over the country, and most of them are open to the public. Some of the German castles have been made into museums, and most of them require a guided tour to enter the castles. Not every castle was built as a defensive structure though, and there are several palaces as well. 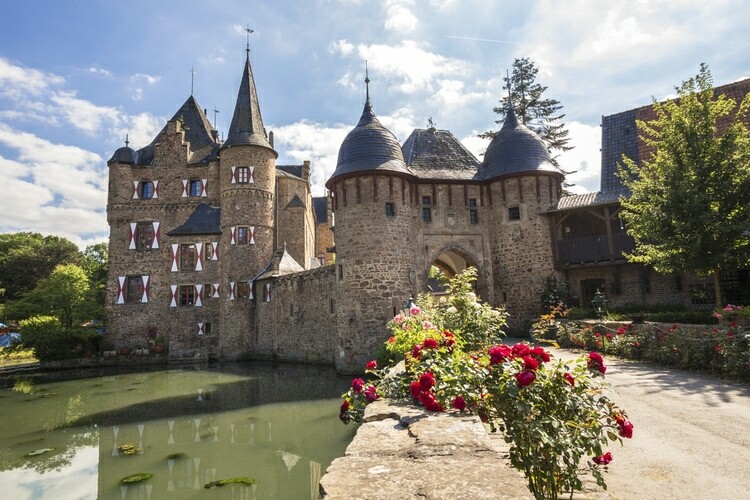 Living in a castle was a sign of being rich and powerful, so it’s not surprising that so many castles were built in Germany during medieval times. 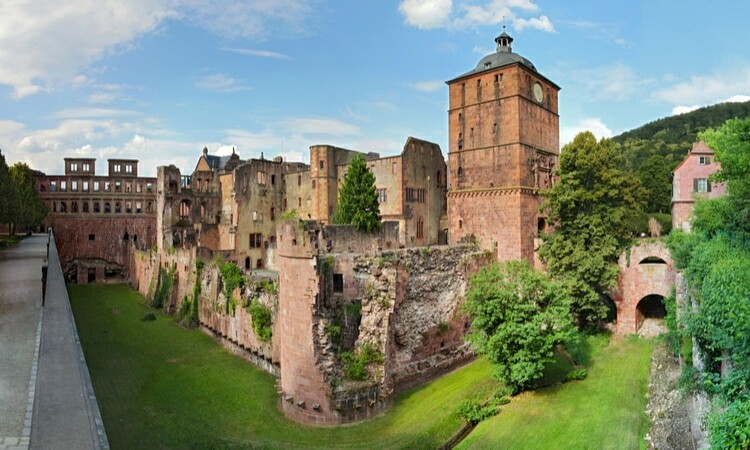 The majority have been destroyed at some point in history and later been rebuilt again, but there are some few exceptions with original castles in Germany that haven’t been destroyed. Can you stay in Castle Hotels in Germany? Yes! 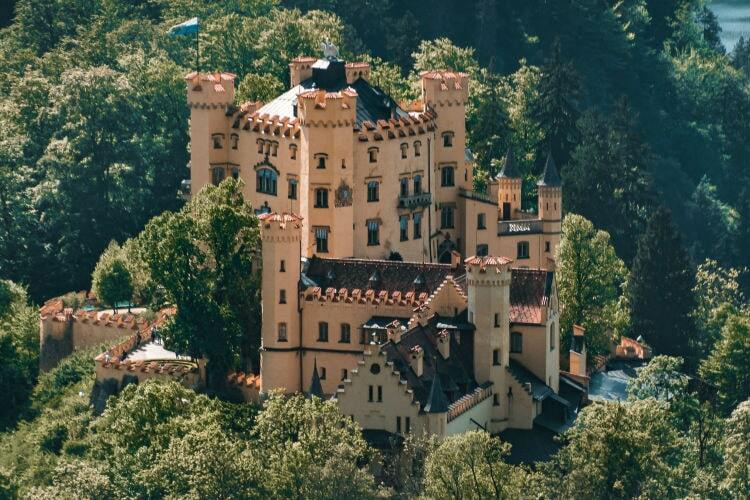 Quite a few German castles have been made into hotels that allow visitors to book a room and stay overnight. Burg Satzvey and Anholt are two fine examples where you can book a hotel room. What’s the difference between a castle and a palace? There are several differences, but one that stands out the most is that palaces aren’t built as defensive structures. 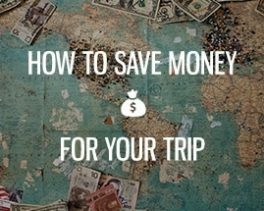 Do you need to book tickets ahead? 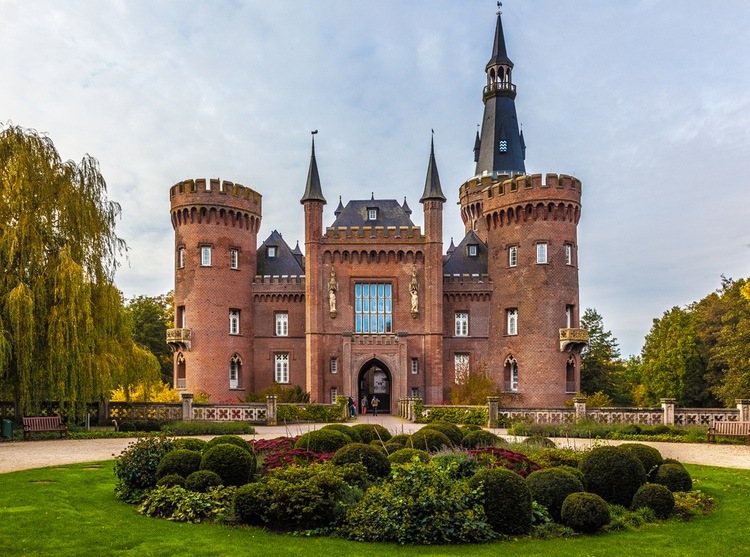 Most castles in Germany doesn’t require a pre-booking and you can pay the admission fee upon arrival. 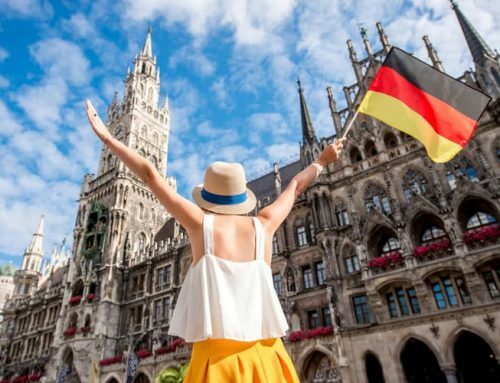 However, Neuschwanstein is one exception and it’s recommended that you book your tickets well ahead. Most German castles have their own guided tour, either in German or English. Some provide Audio guides. 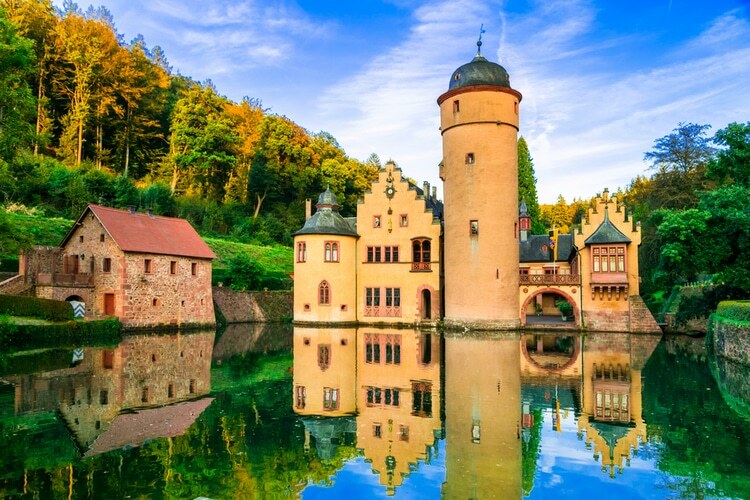 Which of these castles in Germany do you want to visit? Leave a comment below!